On Thursday, January 11, North Royalton City Schools announced the winners of the first semester Crystal Starfish Award presented by the First Federal of Lakewood. 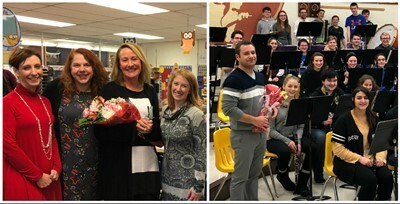 At North Royalton High School, music teacher and band director Mr. David Vitale was presented the Crystal Starfish Teacher Award. Besides the award, he also received a $250 Professional Development Grant from the First Federal of Lakewood, a $50 gift certificate to Cleat’s restaurant and flowers from Independence Flowers and Gifts. Vitale was nominated by several students and community members Highlights of Vitale’s nomination state . . He makes me work to my potential and beyond. He taught how hard it is to be a part of a team and also time management. He has helped me build character and self-discipline. He takes his occupation seriously and creates the impression that his job is not even a job. My entire perspective of music and the level of appreciation that I have for it has grown immensely due to the knowledge, care and dedication he has shown. He uses music to not only teach us how to make beautiful sounds, but also to teach us valuable life lessons like punctuality, following instructions, and working together to achieve a common goal. He puts countless hours into the band program, starting in the summer when he begins to design a competition show and continuing throughout the year as he teaches us how to improve our skills and techniques as performers. He is one of the positive influences on why I want to continue a career with music. Karen Svoboda, a Paraprofessional at Royal View Elementary was the recipient of the Crystal Starfish Support Staff Award. Along with the award, the First Federal of Lakewood presented her with a $50 gift certificate to Cleat’s restaurant and flowers from Independence Flowers and Gifts. Her colleagues wrote . . .
She is a true professional. Her role in our co-teaching classroom is instrumental for our students’ success. She makes an amazing difference for all students and works tirelessly to ensure the students in our room with special needs are making progress. From writing out the morning message to helping students take notes in social studies, she never stops creating opportunities for all students to show all that they know and can do. She is a true champion for students. I trust her and value her as a fellow educator. She is a great example of what makes North Royalton such a great place to work and learn.